From tuna to billfish and more, these reels are designed for absolute reliability. Spool them up with mono, and there isn’t much they can’t handle. 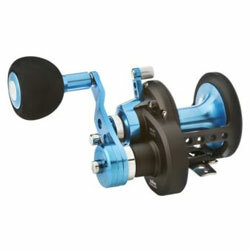 Features include a one-piece aluminum frame and sideplate, helical-cut stainless steel gears, CRBB corrosion-resistant ball bearings, machined-aluminum spool, Ultimate Tournament carbon drag, Infinite Spin freespool, and offset power handle with speed knob. Designed for bulletproof reliability while trolling, this reel will also cast a bait to tuna or sleeper billfish.